Thread: This is way too long..but it has nice pictures..
Well I finally got my Stronglight crankset. All in all it worked out all right. If you don’t remember my last post, I bought a right side crank with a 46 NOS chainring (this was all done on ebay). This was due to me having way too much time on my hands after my bike crash. I have a Peugeot road bike I’ve converted to a SS and I wanted a French Stronglight crank to replace the very nice Sugino I have now. The chainring was a bit shopworn with some surface corrosion (or what ever aluminum does), but cleaned up fairly well. While the 1/2 cranskset was being shipped I bought a very nice and very pricey NOS left side crankarm to complete the crankset. When the right side arrived I cleaned it up and installed it; but something was wrong. It had a very bent arm. Darn. Now I have a $30crankarm I can’t use and a $50 left crankarm to go with it. So with hat in hand I emailed the seller of the left arm and asked the impossible. Turns out she was a class act and let me send it back for a refund; I will make it a point to buy from her again, her name is “Banana_brain555” and she has a lot of cool old bike stuff. The seller of the bent crank was also apologetic and offered an exchange or refund. Anyway so a hunting I went again. 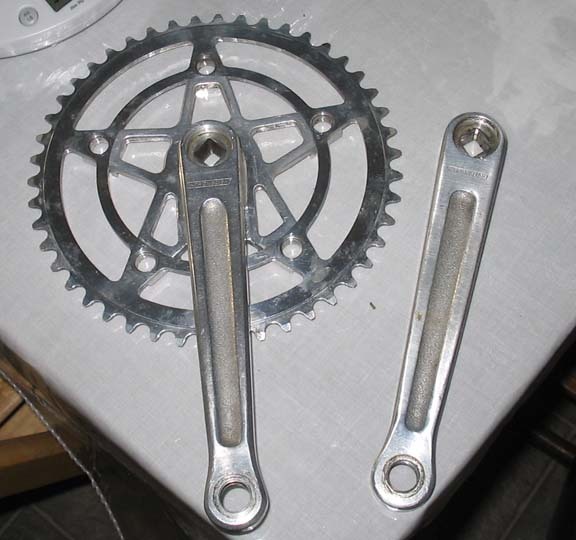 I found almost the exact same crank, only this time it was a set; and with a used but usable 52T chainring. I saw the same seller had a 42T NOS chainring he was selling so I figured if I got crankset cheap enough (I did; cheaper than the left crankarm), I try for the 42T chain ring (easier SS gearing). Well the chainring went for $150!! OMG. I then looked at my 46T ring, figured it was a gift and told the seller I would keep the bent crankarm. Anyway after all this I also ended up with two styles of Stronglight SS chainrings. 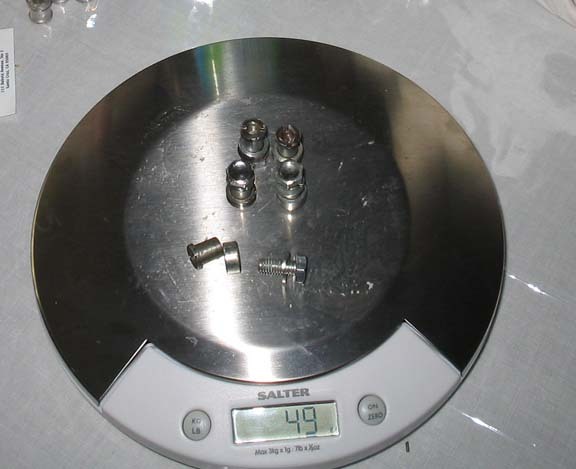 The first look like conventional chainring bolts, are very light aluminum; there even marked “Stronglight”. The others are heavyweight steel and aluminum and Stronglight originals. I plan I using the heavier bolts, but I was fascinated by the different approaches to the same purpose, especially the old old style Stronglight; I just don’t think I’d trust the aluminum. But what do you think? I mean it's a roadbike this time. Last edited by aka brad; 03-12-2007 at 07:22 PM. Ive never had a problem with alum. bolts. I think the chainring would shear before a bolt would. Do I see some non-Allen head bolts mixed up in there? If so, that's not right. 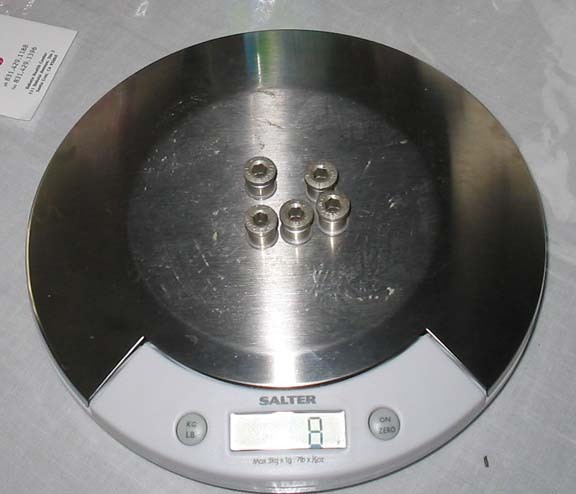 Yes; but they're all that way..
All the steal bolts are non-Allen 10mm bolts; the other side is also much smaller than standard (a standard chain ring tool will not work); I used a metal straight edge.